"Dr. Mehta has all my trust and respect, what a wonderful doctor." "Doctor Mehta has a wonderful personality,and an incredible sense of compassion." "Great doctor. Took care of my broken nose and fixed it with ease." "What a nice man. If I need an ENT again I will definitely come here." 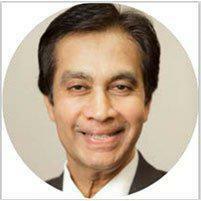 Dr. Navin C. Mehta is an otolaryngologist and facial plastic surgeon in the Gramercy, Manhattan, New York area. Dr. Mehta has been providing compassionate care and highly effective treatments for the residents of New York City since his practice was established in 1984. As a board certified otolaryngology (Ear, Nose, and Throat) and facial plastic surgery doctor, Dr. Mehta provides skilled treatment for ear, nose, throat, and cosmetic facial problems of all types. One of Dr. Mehta's areas of specialty is performing cutting-edge treatments to help restore hearing. He is also one of the leading head, neck, and facial surgery doctors in the area. Dr. Mehta attended Shyam Shah Medical College, where he attained his M.D. He then went on to complete his residency at Shyam Shah Medical College, as well. Dr. Mehta is a specialist in head, neck, and facial cosmetic surgery, skills that he learned during his two surgical residencies. His two residencies were at the Beekman Downtown hospital and the Jewish Memorial Hospital. Dr. Mehta then trained at the New York Eye and Ear Infirmary in the otolaryngology department. He also completed his fellowship at the New York Eye and Ear Infirmary, and continues to maintain an affiliation with them today. When patients are asked to describe Dr. Mehta, some of the first words that come to mind are "compassionate", "helpful", and "thorough". Dr. Mehta is very much dedicated to making sure all of his patients feel comfortable, and that each patient gets the answers and the treatments that they need. Taking the time needed to truly address each individual's concerns and problems is a major priority for Dr. Mehta and his entire staff. We believe in building lasting patient relationships! If you would like to schedule an appointment, call us anytime. We look forward to meeting you! At Dr. Mehta's practice, we accept most major insurance plans. Here is a short-list of just some of the most popular plans we accept. Please contact our office if you do not see your insurance provider listed. "I have to say the waiting area is always peaceful & clean. The staff is always really nice and Dr.Mehta is AWESOME"
"Very professional and up to date with all new medicines. I would recommend Dr. Mehta to anyone seeking specialty services for ENT and I have recommended him to family." "Dr. Mehta was the first doctor able to give me the overview on a three year long complaint." "Great doctor. Took care of my broken nose and fixed it with ease. I have referred lots of people to him over the last few years all came away with great things to say." "Dr. Navin Mehta is a wonderful doctor, certainly the Best in his kind with great knowledge. My family and I have been with him for over 20 years without any complaint." "My children were referred to Dr.Mehta's office a few years ago and I have to say the waiting area is always peaceful & clean." "Dr. Mehta seems like a very kind person, he was absolutely professional, explained everything well and was fast but not rushed. Excellent experience..."